The phenomenon of “Traitorization” in Tamil Nationalist Politics has raised its ugly head again. I use the word traitorization instead of treachery or treason in order to differentiate between those who are actually treacherous or really committing treason as opposed to those being accused or labelled as “traitorous” or traitors. The reality is that most persons dubbed as traitors or “thurogigal” by their political opponents are not “guilty”as charged and do not deserve such a description. “Traitorization” is a terrible “Goebbelsian” process by which political rivals are falsely portrayed or depicted as traitors. 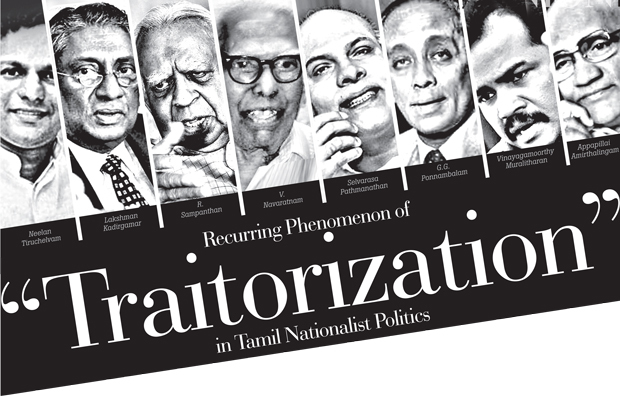 The “Traitor” label in contemporary Tamil political discourse refers generally to Tamils accused of working against the Tamil cause and/or collaborating with the enemy. Concrete proof of such conduct is not necessary. What is required is a massive propaganda effort by which the cry, traitor, is repeated incessantly at multiple levels as advocated by Herr Goebbels in Nazi Germany. It was Adolf Hitler’s propaganda minister Paul Joseph Goebbels who stated “If you tell a lie big enough and keep repeating it, people will eventually come to believe it”. Repeating the charge traitor continuously is the modus operandi of traitorization in Tamil National politics. “Cry Traitor” and let slip the dogs of propaganda war! Tamil Nationalist Politics made use of the Goebbels technique liberally in dubbing those perceived political rivals as traitors. Merely holding a different political view was sufficient to be called traitors to the cause or collaborators with the enemy. The problematic was that both the cause and enemy were difficult to define clearly. Moreover, the nature of the cause as well as the identity of enemy underwent changes periodically. Despite these fluctuations, what remained constant was the practice of traitorization. Success in the traitorization process was not determined by the substance of truth but by the ability to propagate what was supposed to be the truth. It was not the absolute truth or superior idea that prevailed in the hurly - burly of Tamil Nationalist politics. What succeeded ultimately was the powerful propaganda of one side to paint the other as traitor. Golden Brain, an interesting example would be the fate of former Kayts MP V. Navaratnam described at one time as the Golden Brain of the Federal Party. MP Navaratnam, a founder member of the party broke ranks in 1968 and formed the “Thamizhar Suyaatchik Kazhagham or Tamil Self –rule party. He adopted a more extreme line and proposed a Tamil State/Self –Rule instead of Federalism being espoused by the FP known in Tamil as the Ilankai Thamil Arasu Katchi(ITAK). Navaratnam’s party contested the 1970 polls on a platform of Tamil self-rule while the ITAK/FP continued to advocate a Federal solution. The ITAK condemned Navaratnam’s separatist policies as harmful to the Tamils and faulted him for exposing the community to great danger. There was a famous verbal duel in 1970 at Puliyankoodal, where Appapillai Amirthalingam and V. Navaratnam engaged in open debate. Amirthalingam argued eloquently that separatism was suicidal for the Tamils. Forming a new party amounted to fragmenting Tamil unity it was said. Navaratnam and fellow candidates were denigrated as traitors to the cause in the election campaign. All of them lost and the ITAK once again became the single largest Tamil party with 13 seats in the 1970 election. Navaratnam, the man praised as the golden brain was now in political oblivion his reputation tarnished as traitor. Things changed. The ITAK and All-Ceylon Tamil Congress (ACTC) came together and formed the Tamil United Liberation Front (TULF) in 1976. The TULF now advocated a separate state for Tamils. The same set of ITAK politicians who said separatism was suicidal now became ardent proponents of Tamil Eelam. In such, a changed environment one would have expected Navaratnam to be vindicated. That was not to be so.The man called Traitor for proposing self–rule continued to be in the cold despite the main Tamil parties supporting separatism. The TULF swept the polls in 1977, but Navaratnam lost again. Instead of being honoured as a “prophet,” Navaratnam languished as traitor still. Such was the power of propaganda in Tamil nationalist politics. The prophet could be portrayed as traitor and condemned eternally. “Thiruvilaiaadal”; The “Thiruvilaiaadal Puraanam” relates the Sixty-four “thiruvilaiaadalgal” or divine antics of Lord Siva. Among these is the story of how Lord Siva helped his devotee Maanikkavaasagar who composed the verses of “Thiruvaasagam”. The tale is about how Lord Siva did a transforming act - “Nariyaip Pariyaakki, Pariyai Nariyaakki” (changing jackals into horses and horses into jackals) - to save Maanikkavaasagar from the King’s wrath. Just as Lord Siva turned the “nari’ or jackal into ‘pari”or horse and vice versa , Tamil nationalist propaganda too is capable of transforming a hero into traitor and vice versa. "Navaratnam, the man praised as the golden brain was now in political oblivion his reputation tarnished as traitor. Things changed. The ITAK and All-Ceylon Tamil Congress (ACTC) came together and formed the Tamil United Liberation Front (TULF) in 1976. " The absurd logic followed in this traitorization exercise could be viewed as farcical but for the fact that it gradually assumed a drastic form . When people got killed as traitors it was no longer a comical exercise. It became tragic. The tragedy in Tamil politics is that this process of traitorization has led to large scale killings of politicians, govt. officials, Police and defence personnel, media personalities etc, as traitors by contending political groups. Also countless persons, though not killed physically have been “killed without killing”(Nomaraa maru/Kollaamal Kondru)by character assassination as traitors. Almost all Tamil political groups and organizations have engaged in traitorization but the lion’s share in physically exterminating people as traitors goes to the tigers. It is a sad fact that the cream of Tamil society was destroyed extensively as traitors by the Liberation Tigers of Tamil Eelam(LTTE). Members of the Tamil political elite killed by the Tigers outnumber those killed by the Sri Lankan or Indian armed forces. Another aspect of this traitorization phenomenon was that nothing was constant. Everything was variable. When Tamil political parties and groups opposed the LTTE or were independent of the Tigers they were all branded as traitors. However, when these non–LTTE elements formed the Tamil National Alliance (TNA) and became subservient to the tigers the “traitor”stigma withered away. The traitors were purified as patriots. Thus Kandiah Premachandran alias Suresh, who was at one time called the “traitorous”chief of the EPRLF is nowadays the spokesperson of the TNA and talked of as a Tamil patriot. “Mahathaya” On the other hand Goplasamy Mahendrarajah alias “Mahathaya” and Vinayagamoorthy Muralitharan alias “Karuna”underwent a different experience. When Mahathaya was the LTTE’s deputy leader and Karuna the Eastern commander of the LTTE, they both were able to condemn others as traitors and order their executions. Many were killed as traitors on their orders. However, when both senior Tiger leaders at different times fell foul of LTTE supremo Veluppillai Prabhakaran, they were “transfigured”into traitors. Their loyalists were killed as traitors too. Mahathaya himself was executed but Karuna jumped the ship in time and saved himself. Apart from the moral question as to what right anyone has to dub someone a traitor and kill him or her, there is also the terrible fact that most of those killed as traitors did not fit that description at all. They were mostly people holding different political views from those opposing them. In many instances those projected as traitors were seen as impediments to the progress of others in political terms. Politicians would promise the moon and get votes. They would then give excuses for their inability to deliver by blaming opponents as traitors. It is because of these traitors that we are unable to reach the promised land was the lament. Another aspect of traitorization was the emphasis on Tamil unity. It was argued that Tamils should unite and rally around a single political formation or party. In short, everyone should vote for “THE”party. Other parties cutting into these Tamil votes were engaging in traitorous activity it was alleged. Only candidates from “THE”party should be supported and elected. If not “traitors” from other parties would be elected was the rationale. When democratic politics gave way to armed militancy, this emphasis on Tamil unity continued. “katchi”(party)gave way to “Iyakkam”(movement). Only “THE”movement should be supported to demonstrate Tamil unity. Other movements were traitorous.This attitude soon led to skirmishes and then to fratricidal warfare. Youths who thought they were sacrificing their lives at the altar of Tamil Eelam found themselves being butchered as alleged traitors. The same Tamil society which exalted one group of militants as great heroes allowed other groups of militants to be massacred as traitors. What is of importance here is to note that Tamil nationalist politics has not succeeded so far in achieving any of their objectives independently. Be it the Tamil Congress, the ITAK, the TULF or the TNA, on the one hand and the Tamil militant groups including the LTTE on the other; they have all failed so far. The solitary gain has been the 13th Constitutional amendment brought about by the Indo-Lanka agreement. Despite this failure on the political front, Tamil nationalist parties and organizations have continued to reign supreme. A key device in this near monopolistic control of the Tamil polity by Tamil nationalist politics has been the usage of the traitorization practice. The failure to deliver has been explained away by the excuse of traitorization. The political stupidity of setting unrealistic unachievable goals is not accepted, instead, the fault is attributed to traitors in our midst. Tamils are told that the fault lies not in ourselves but in our traitors! As stated earlier when the phenomenon of traitorization began people were not assassinated. They were only character assassinated as traitors. But the rise of armed Tamil militancy in the 70’s of the last century brought about a sea of changes where politicians, officials, civilians and militants got killed as traitors. Mercifully this practice of killing traitors came to an end after the Liberation Tigers of Tamil Eelam (LTTE) was militarily defeated and destroyed in the Island in May 2009. The traitorization process, however, remained but lost much of its potency without the LTTE. In recent times, the traitorization spectre seems to be rising up again with the burning of effigies and portraits of some TNA politicians by others. If unchecked at this juncture, the phenomenon could develop into a great danger as it was in the past. It is possible with the wisdom of hindsight to conjecture a dire situation emerging once again. It is against this backdrop that this writer focuses again on this phenomenon of traitorization in Tamil nationalist politics. Even though I have written about this on earlier occasions , I shall once again try to delve into this malady threatening to afflict Tamils again. As noted earlier, the political violence that destroyed hundreds of alleged traitors in the past was explicitly and implicitly justified by the perpetrators as being necessary to ensure Tamil unity and take forward the struggle for Tamil equality. The tendency was to view all those holding or perceived to be holding different political opinions to that of the dominant one in vogue as being traitors. Dissidence was equated with treachery. There was a tendency to view mythology and history in a convoluted form. Signs of real or imaginary betrayals were portrayed as the causes for the downfall of those depicted as ‘heroes’ in mythology and history. Ravana the demon king of Lanka who abducted Sita was defeated by her husband Rama, an avatar of Lord Vishnu. The Dravidian ideologues however attribute treachery as the cause because Ravana’s brother Vibheeshana crossed over to Rama’s side. The feudal “Paanchaalankurichi” chieftain (Polygar) Veera Paandiya Kattabomman defied the British and was vanquished by superior firepower. In popular parlance Kattabomman lost only because another Polygar Ettappa Nayakkar of Ettayapuram joined forces with the British. Betrayals by traitors is assumed as cause of defeat. Thus Ravanan had his Vibeeshanan and Kattabomman his Ettappan in mythology and history. A brief re-run of the recent past will help to place in perspective the recurring phenomenon of traitorization in the Tamil nationalist political sphere. In contemporary times, the evolution and growth of representative democracy in Sri Lanka saw the term ‘throgi’ or traitor being bandied about liberally and rather loosely . Politicians of all communities have at times accused their rivals of being traitors to the people or to their “just” causes. This tendency however has been more pronounced and deeply embedded amidst the Sri Lankan Tamil polity. Ever since universal franchise and territorial representation shattered the Tamil self-perception of being equal to the Sinhala ‘numerical’ majority, the nature of Tamil politics underwent transformation. The underlying thread of Tamil politics became political emancipation. Be it balanced representation, responsive co-operation, federalism, regional autonomy or separatism - it was the discourse of Tamil liberation that dominated the polity. "he fact that it gradually assumed a drastic form . When people got killed as traitors it was no longer a comical exercise. It became tragic. The tragedy in Tamil politics is that this process of traitorization has led to large scale killings of politicians, govt. officials, Police and defence personnel, media personalities etc, as traitors by contending political groups." The growing community consciousness and the high premium placed on ethnic solidarity created a situation where the people at large were expected to strike common course on political issues. ‘Ottrumai’ or unity became the dominant cry. It was seen as the most convenient mode of mobilizing votes for a particular party on an ethnic basis. It was also easy to label any Tamil involved with Sinhala dominated parties - be they nationalist or leftist - as being collaborationist with negative connotations. Thus, anyone differing or seen as deviating from whatever dominant political opinion within the Tamils was depicted as betraying the cause and community. They were described as weeds that had to be ‘weeded out’ (kalaieduppu). In the early days, this weeding-out of political rivals depicted as traitors was strictly electoral. They had to be defeated at the polls and nothing more. It was also easier to undermine those in power through this type of propaganda. "By the mid –seventies of the last century, the dominant mood in Tamil politics was separatism. This led to armed struggle as the only way to achieve Tamil Eelam. As the years progressed the scenes and actors changed from time to time but the drama of traitorization went on." At the tail end of British rule G.G. Ponnambalam and his party the All-Ceylon Tamil Congress demanded a scheme of balanced representation popularly known as “fifty-fifty. This was unacceptable to the Soulbury commission which granted a dominion constitution. When elections were held, G.G. Ponnambalam and the Tamil Congress got the better of Sir. Arunachalam Mahadeva and the UNP Tamil candidates by calling those who supported the Soulbury Constitution traitors. After Independence dawned the pragmatic Ponnambalam changed his stance to “responsive cooperation”. He joined the Government and became Industries and Fisheries minister. Then it became Ponnambalam’s turn to be called traitor by S.J.V. Chelvanayagam and the federalists after GG became a Minister in D.S. Senanayake’s Cabinet. The FP used the traitor label liberally to undermine their rivals. However, when Chelvanayagam and the FP became ensconced in Dudley Senanayake’s national government in 1965, former Kayts MP V. Navaratnam broke ranks and formed the Tamil Self-rule Party. His criticism of the FP as traitors did not carry much conviction at that time because of the high esteem in which Chelva was held. But Navaratnam was called traitor for breaking Tamil unity and forming his own party and suffered the consequences. Earlier it was difficult to brand the Samasamajists and Communists as traitors by the Tamil nationalist parties because of the very progressive stance taken by the left on the national and language question. After the left changed course and joined forces with the SLFP and adopted the “Dudleyge Bade Masala Vadai” line, it became easier to ‘traitorise’ them too. The practise of demonizing political adversaries as traitors took a qualitative turn in the 1970-77 period. The fiery Tamil poet Kasi Anandan thundered in 1972 that none of the traitorous six Tamil MPs who supported the Republican Constitution of 1972 should die of natural causes. It also became clear that some Tamil politicians like the popular Jaffna Mayor Alfred Durayappah would be difficult to defeat politically because of widespread people support. Durayappah was continuously described as traitor in the TULF organ ‘Suthanthiran’. He was portrayed as the cause for all problems affecting Tamils and it was argued that his elimination would usher in a new dawn for the Tamils. Impressionable young Tamil minds got the message. Durayappah was gunned down in July 1975. Later Prabhakaran was to call it his first “military” operation. None of the TULF leaders condemned Durayappah’s killing then. By the mid –seventies of the last century, the dominant mood in Tamil politics was separatism. This led to armed struggle as the only way to achieve Tamil Eelam. As the years progressed the scenes and actors changed from time to time but the drama of traitorization went on. In the forties of the 20th century, any Tamil not subscribing to “fifty-fifty” was a traitor. After Independence, any Tamil rejecting Federalism was a traitor. Later on, any Tamil opposing a separate Tamil state became a traitor. Then any Tamil protesting against armed struggle became a traitor. Thereafter all organizations, other than the LTTE were called Traitors. After the LTTE was defeated and the Tamil Eelam demand lost its vigour, the concepts of “Thaayagam”(homeland), “Suyanirnayam”(self-determination) and “Theasiyam”(nationhood) became the new Mantras of Tamil nationalism. Anyone opposing these three concepts is a traitor. When the UN Human Rights Council passed a resolution on Sri Lanka, the Tamil extremists said it lacked sting and opposed it. The UN probe was an eyewash it was alleged. Tamils supportive of the resolution were called traitors. Now the very same lunatic fringe is opposed to the UN Probe report being delayed. Any Tamil in favour of the UN report being released in September is a traitor. In the aftermath of CV Vigneswaran’s genocide resolution all Tamils are expected to chorus “Genocide, Genocide”. Anyone failing to chant the “G-word” will soon be dubbed traitors. Traitors will be created and Traitors will be decimated but, Traitorization like Tennyson’s brook “will go on for ever”. The spate of political killings within the Tamil community that began with the Durayappah assassination continued for years and then decades. So many eminent Tamil leaders like Dr. Neelan Thiruchelvam and Lakshman Kadirgamar have been killed as traitors. During the time of Mrs. Bandaranaike from 1970 to 77, Tamil policemen were suspected informants, Tamil activists of the SLFP etc. were killed as traitors. In July 1977, JR Jayewardene and the UNP target shifted. After 1977 it became the turn of Tamils affiliated to the UNP to be killed as traitors. This spree of killings continued throughout the Premadasa, Wijetunga, Kumaratunga and Rajapaksa periods until 2009. Intra-Tamil killings of alleged traitors took on new forms and content. The TULF which called Tamil political opponents traitors found themselves traitorized with the passage of time. Tiger guns turned on the TULF and ex-Kopay MP, Aalalasundaram was shot and injured in 1982. It was only then that Amirthalingam issued a hard-hitting statement saying “after biting the goat and cow, the animal had now bitten a human.” As the Tamil liberation struggle ‘progressed’ the militants began calling the TULF leaders traitors. Soon many were killed. Amirthalingam who had described many a political opponent as being traitor was killed and unfairly accused as traitor himself. The guns also began turning sideways and inwards. Soon there was fratricidal warfare among the Tamil groups. Organizations were dubbed wholesale as traitors by the LTTE and were prohibited from the Tamil areas. Massive killings of rival groups followed. When the Indian Army was here and war with the LTTE erupted, several Tigers were killed by groups toeing the Indian line like EPRLF, ENDLF and TELO. After the Indian Army left, the Tigers massacred wholesale those members of the pro – India Tamil National Army. Both sides described each other as traitors of the Tamil cause. This practise continued. The LTTE killed more than 60 members of organizations like the EPDP, PLOTE, TELO and EPRLF after the ceasefire in 2002. They were all branded as traitors. Later the roles reversed and Tamil “paramilitary” groups aligned with the state killed many Tamils suspected of LTTE links as “enemies of the state”. They were traitors to Mother Lanka from the Sri Lankan State’s point of view. After President John F. Kennedy was assassinated in Dallas in November 1963, the Black American leader Malcolm X spoke at a “Nation of Islam”meeting in December 1963. When asked about Kennedy’s killing, Malcolm X in his reply seemingly justified it. He said “President Kennedy never foresaw that the chickens would come home to roost so soon...Being an old farm boy myself, chickens coming home to roost never did make me sad; they always made me glad.” Malcolm X himself was shot dead two months later in February 1965. "In the present situation, comparatively moderate TNA leaders such as R. Sampanthan and M.A. Sumanthiran are also being labelled as traitors. Their portraits and effigies are being burnt. TNA national list Parliamentarian Sumanthiran is the favourite target of the LTTE elements. He is being vilified widely as a “thurogi” or traitor. As noted earlier, the practise in the past when the Tigers were riding high was to demonize someone as a traitor and then exterminate him." It was a case of the chickens coming home to roost as far as Sri Lankan armed militancy was concerned. The Greek myth about “Titan Cronus” or Saturn feared that he would be overthrown by one of his children. So he devoured the children one by one as they were born. Like Saturn devouring his own children, the Tamil liberation struggle too devoured its own children. The internecine violence was sought to be justified by the real or imagined existence of traitors. The victims of violence were all traitorized. Later some of the perpetrators themselves were victimized by the violence. The pendulum now swung the other way and those who traitorised others were in return traitorised. Former LTTE Deputy Leader, Gopalaswamy Mahendrarajah alias Mahattaya who went public in denouncing Amirthalingam as a traitor was himself later executed by the Tiger supremo. Mahattaya was now called traitor and charged with conspiracy to overthrow Pirapaharan. More than 150 of his supporters were also killed as traitors. Mahathaya was also killed after a protracted Kangaroo Court Trial. Mahathaya had ordered the killing of several PLOTE, EPRLF and TELO cadres as traitors when he was at the Tiger helm. The PLOTE indulged in killing hundreds of their cadres as suspected traitors. Youths were killed and disposed of in the training camps run by the PLOTE in Orathanaadu in Tamil Nadu. A senior cadre who specialized in killing the cadres suspected of being traitors acquired the name “Dumping” Kandasamy on account of this. Later on, many PLOTE leaders and cadres were killed by the LTTE as traitors. Finally, the PLOTE head Uma Maheswaran alias Muhunthan who was reverentially called “Aiyah” and “Periyavar” by his followers was killed by his own men and dumped on the rail track in Bambalapitiya. His killers said it was punishment for being a traitor. The TELO split into the “Bobby” and “Das” factions. Sree Sabaratnam, the TELO head was partial towards the Bobby faction. Das hailing from Udupiddy in Vadamaratchy was lulled into a false sense of security by Sree Sabaratnam. He was lured into the Jaffna hospital without arms and killed in the premises. Thereafter the Bobby faction unleashed violence on the Das faction calling it traitor. When residents of Vadamaratchy took out a procession in protest were fired at by the TELO, which issued a press release saying traitorous forces were fired upon. Within months the LTTE struck at TELO and killed hundreds of TELO cadres. Sree Sabaratnam was captured and personally executed as a traitor by the LTTE Jaffna commander “Kittu” on May 5, 1986. The revolt of former Eastern Tiger commander Vinayagamoorthy Muraleetharan in March 2004 saw the “mainstream” LTTE executing a large number of “rebel” cadres as traitors. Soon Karuna allied with the State and unleashed violence against Praba- loyalists dubbing them traitors of the east. The LTTE has killed a number of people within and outside the movement as suspected traitors over the years. It was in the neo-fascist nature of the LTTE to discover more and more new traitors on a regular basis. Anyone seen as holding different opinion or not toeing the line was easily labelled traitor. There were numerous instances of many being wrongfully accused and executed. Even in a post-Prabhakaran situation, the LTTE’s tendency to demonize those with different viewpoints as traitors continues within the global Tamil Diaspora. Selvarasa Pathmanathan alias KP and his supporters are called traitors by the Tiger and pro-Tiger elements opposing him. So too are Karuna, Pillaiyan, Daya Master and other ex-LTTE members co-operating with the state. It is only a matter of time before Cabinet Minister D.M. Swaminathan and deputy Minister Vijayakala Maheswaran in the new Sirisena-dispensation are dubbed traitors as former Cabinet Minister Douglas Devananda and ex-deputy Minister Muralitharan were traitorised in the previous Rajapaksa regime. Any Tamil, proposing conciliatory politics or supportive of co-operation with the Government have the Damoclean sword of Traitorization hanging over them. In the present situation, comparatively moderate TNA leaders such as R. Sampanthan and M.A. Sumanthiran are also being labelled as traitors. Their portraits and effigies are being burnt. TNA national list Parliamentarian Sumanthiran is the favourite target of the LTTE elements. He is being vilified widely as a “thurogi” or traitor. As noted earlier, the practise in the past when the Tigers were riding high was to demonize someone as a traitor and then exterminate him. Mercifully, this is no longer an option for the Tigers and their fellow travellers because of Mahinda Rajapaksa, who has bestowed a great gift upon the Tamils by destroying the LTTE militarily in Sri Lanka. In a post-Prabhakaran era, the course of action available is not assassination but character assassination. The idea is to “kill without killing” by portraying the targeted victim as a traitor. Unable to kill physically, the bloodthirsty fiends satisfy their lust by “cremating” portraits and effigies. However, there is the danger of this trend acquiring a destructive capacity if left unchecked or contained now. This traitorization mania affecting Tamils has resulted in countless people being killed as traitors in the past. It has reared its ugly head again in the present and has the potential to become a serious problem in the future. The recurring phenomenon of traitorization is a Tamil tragedy for which others cannot be blamed. There is an urgent need for serious introspection. The Tamil people must address this issue that has destroyed the community in the past and could do so in the future too.